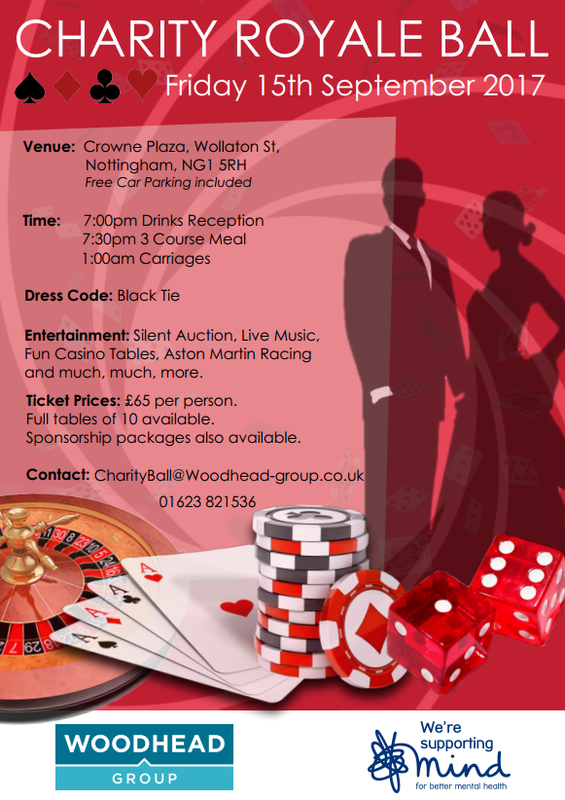 Following last years success The Woodhead Group have announced plans for this years charity fundraising ball. We would be delighted to be able to provide you with an invitation to purchase tickets for this year’s Woodhead Group ‘Charity Royale Ball’ to celebrate and raise money for our charity of the year 2017, Mental Health Charity, ‘Mind‘. In 2016 we collectively raised an amazing £30,798.52. This couldn’t have been possible without your remarkable support. We hope this year we can surpass that! Entertainment: Silent Auction, Live Music, Fun Casino Tables, Aston Martin Racing and much more. Price: £65 per person. (Tables of 10 available are also available). We also have a number of discounted bedrooms available on allocation at £87per double room including breakfast for those of you who would like to stay overnight – contact myself to get the information for this. We really hope you can make it and join us for this fun filled evening! If you would like to purchase a ticket, table or sponsorship package please contact CharityBall@woodhead-group.co.uk.